Filtering in AccuRanker is very powerful and easy to use. Whether it would simply be finding the keywords you are looking for or doing the keyword research. Filters in AccuRanker can help you get exactly what you are looking for, quickly. 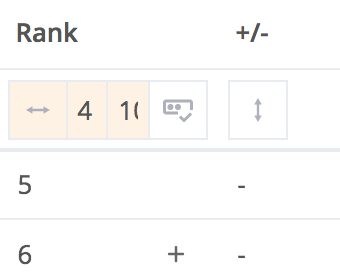 Each column in your keywords list, has its own filtering options at the top. So for your keywords, you will be able to search through your keywords and filter for tags. For numeric values, such as search volume or rankings, you can choose between values lower- or higher than what you type. Filters will also apply to the overview and when downloading reports, if they haven't been reset. Each filter you create, is listed at the top of the page. Other than seeing all your active filters, you can also save them as segments for later use. This comes in very handy if there is a set of features, you are planning on using often. Helps identifying keywords with traffic. Once you have tagged your keywords, you can also filter your keywords list to include- or exclude certain tags. Read more about tags here. Find out how many of your keywords are local results, featured snippets or other useful information. Sorting through keywords is as simple as simply clicking on the column itself. Want to stay up to date with your most important keywords? Read our articles about notifications here.